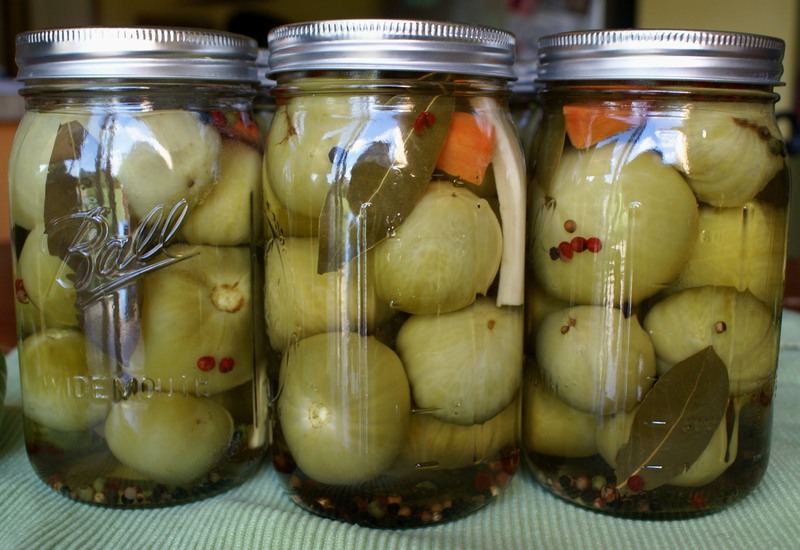 How to pickle green tomatoes? 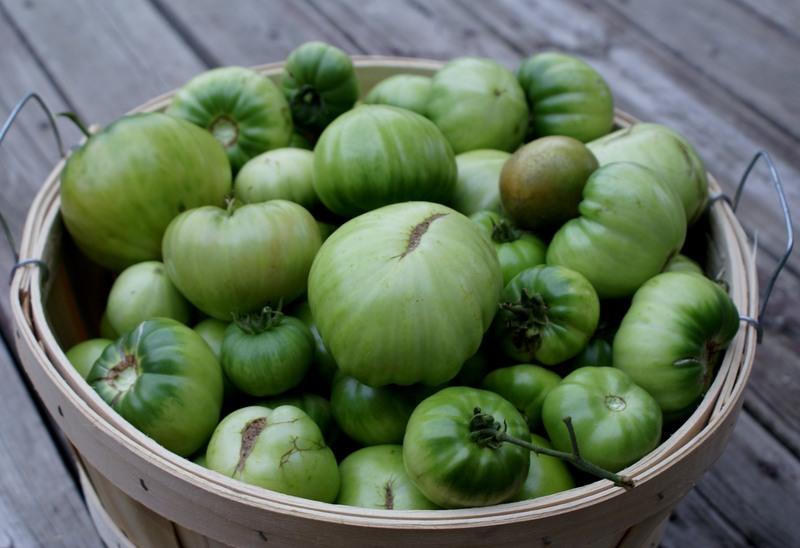 This recipe is enough to pickle about 7-8 lbs (3-4 kg) of green tomatoes. 1. Wash and dry green tomatoes, set aside. 2. Wash the jars and lids with soap and water, rinse. Fill a stock pot with water and let it boil. Submerge jars and lids into boiling water for 5 minutes to sterilize. Grab them with tongs, drain the water and set upside down on paper towels. 3. When all the jars a dry, turn them up, set them onto a large sheet pan. Pre-heat the oven to 350 F (175 C) and place the jars (lids not) in the oven for about 10 minutes to heat them. 4. In a large stock pot, combine water, vinegar, salt and sugar. Let it boil until sugar and salt dissolves. 5. Take the jars out of the oven. Fill them tightly with the small green tomatoes. If your tomatoes are big, quarter them before putting into jars. Don’t overfill! Also place 2 bay leaves, 1 stick of horseradish and 1.5 tsp of peppercorn into each jar. Take 2 carrot sticks and place them cross-wise on the top of the jar (to press the tomatoes). 6. Pour the water-vinegar mixture into jars to cover the tomatoes. (Jars and liquid both, need to be hot). Cover with plastic wrap for a while. When they have cooled down, put the lids on. 7. Store in a cool, dark place. It takes about 6 weeks for green tomatoes to pickle. 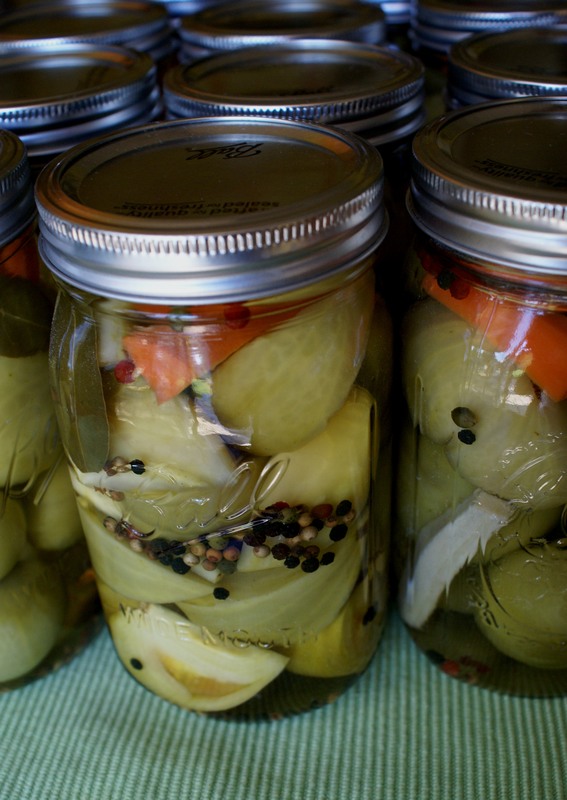 Use them just as you would use pickles. You make me wish I had green tomatoes AT THIS VERY MINUTE to go and pickle!! Very nice and comprehensive step by step directions, which made me realise the importance of thoroughly sterilising jars before using them for preserving anything! Thanks so much Munira! I really enjoyed canning them. It reminded me on good old times! 🙂 Pics are in! This is a month too late, but, will certainly be using it. I only had one tomato plant this year, and it yielded well. The Hurricane blew it over, and all the tomatoes away that were on it last month, but I propped it up and it bloomed out one last golf ball sized tomato, before I walked past it and noticed it was half gone!! !A closer look revealed the twisted green vine around it’s stem, wasn’t a vine at all but a canker worm!!! I just left him to finish it off…and he did by the next time I looked at it…the tomato was completely gone…as was the fat green vine.